Nearly all parents acknowledge that while raising children can be the best and most rewarding job of their lives, discipline is often the most complicated, challenging, and frustrating aspect of parenthood. But how do parents promote good behavior? How can they be firm without shouting and having their child (or themselves), end up in tears? And, does discipline really have to be unpleasant to be effective? 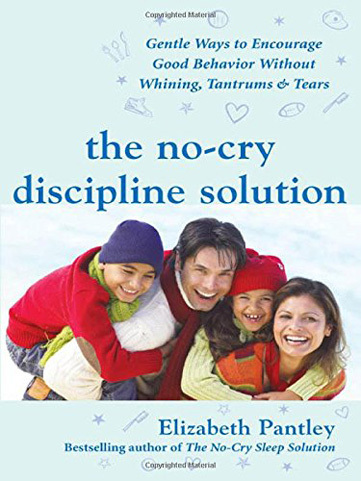 In The No-Cry Discipline Solution (McGraw-Hill, June 2007), bestselling parenting author and mother of four, Elizabeth Pantley, shows how discipline can be approached in a positive, even fun way, and how to tailor discipline techniques to each child – without the whining, tantrums, and tears. Tested by hundreds of families worldwide and in every childrearing situation: working families, single & stay-at-home parents, twins and multiples, and children of varying age and temperament, No-Cry Discipline offers thought-provoking advice on the role of parents, ways they can better understand their children, and practical, achievable information that can make life easier. Pantley includes dozens of ‘real life’ examples and tips from parents worldwide. Divided into four parts, No-Cry Discipline begins by looking at essential parenting attitudes to build a strong foundation, banishes the discipline myths, and looks at discipline and emotional control. Pantley also examines everyday discipline challenges, identifies how to solve the real problem, and demonstrates the key No-Cry Discipline parenting skills and tools to stop the whining, tantrums and tears. The final parts of the book examine the importance of staying calm and avoiding anger for a peaceful home and how to reduce anger-producing situations. There is also a dedicated, ‘lifesaver’ section on specific solutions for those frustrating everyday problems, including such topics as bath time, biting, car travel, dawdling, hitting, interrupting, lying, manners, mealtime, sharing, sleeping, screaming, and shouting. Pantley, who is warmly supportive of parents, believes that discipline is not about a ‘one size fits all’ set of rigid guidelines, nor is it about punishment or tears. She shows parents that discipline is principally about teaching children the rights and wrongs and helping parents to develop their own effective formula of discipline techniques based on the individual temperament and needs of the child. Excerpted with permission by McGraw-Hill Publishing from The No-Cry Discipline Solution (McGraw-Hill, 2007).